Sean Flynn should feel lucky he's alive. But a betrayal by a close friend--and two years on death row--has left him feeling only numb. When his conviction was overturned, Sean retreated to a quiet woodland cabin, far away from prying eyes. There, he believed, the past couldn't come back to haunt him... until she showed up. Overcome with guilt, Deputy Prosecuting Attorney Krista Slater can't forgive herself for convicting an innocent man. But when another brutal murder reveals chilling, new facts about his case, she must turn to Sean for help. She's ready to face his anger, but the desire in his eyes ignites a need she's never felt before. Shadowed by danger, Sean and Krista uncover a twisted maze of deception and betrayal--all under the dangerous gaze of a cunning mastermind who will do whatever it takes to keep his evil secrets safe. First of all, some parts of the copy/pasted summary blurb above is a bit misleading. I wouldn't necessarily call the main antagonist of this book a "cunning mastermind," to be honest. He's really just another evil, malicious dude with a lot of money and no conscience, and a hard-on for power. And also, while I'm not a fan of seeing into the villain's aspect of the story, you really DON'T see enough of our main antagonist's side of things to be able to conclude that he's a criminal mastermind of some kind. In fact, the guy is so perverted and evil that he almost comes off a bit comical. I didn't necessarily like Hide from Evil any better than I liked Beg for Mercy, which is a slight disappointment, because Sean Flynn was my favorite character from the mess of frustrating characters of the first book in this series. Even Krista Slater had potential, and so I really DID kind of look forward to reading this second book. Instead, it was really just kind of mediocre. It was less frustrating than Beg for Mercy, and I didn't find myself rolling my eyes or calling our main characters names or anything, if that's any consolation. 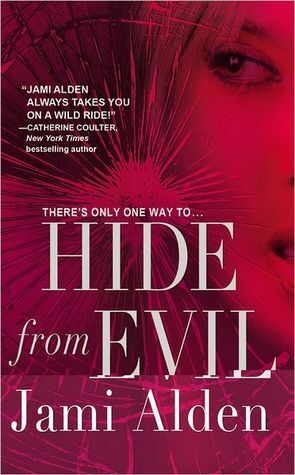 Hide from Evil is definitely a page-turner--I'll give it that. But aside from being an exciting, forward-moving story line, I'm not entirely sure it did anything for me. Sean is a good person. Krista is a good person. They were portrayed quite well, actually, from Sean's jadedness to Krista's righteousness; everything fell right into place where they needed to be. Both characters' development throughout the book was pretty good, actually. The romance was decent, a little too abrupt in some matters, but overall kind of believable. The rest of the story was stock-standard crime thriller, as one expects. And so while Hide from Evil wasn't a bad book, it wasn't exactly memorable either. I suppose it's a great way to pass the time until the next read, but it's not a book to help bring a gal out of her end of year reading slump, that's for sure.